We all have dreams for ourselves. Sometimes we have dreams for others. Some would even say we have great expectations. Inspired by Charles Dickens’ classic “Great Expectations,” The Assembly has lifted the characters from the page and transported them to modern times and ideals, exploring just exactly their great expectations. That Poor Dream is one of the most daring and innovative pieces to grace the indie stage recently. With the majority of the action occurring on a train from New York to Fairfield, Connecticut, That Poor Dream follows endowed Pip and a mysterious traveler who was a huge part of Pip’s past. On their journey, the action jumps back into dreams and memories that inform the future and tackles the themes of the piece. Devised by the company, That Poor Dream began as an exploration of class and economic disparity using the structure of the Dickens’ novel as the source material for a modern spin on American Dreams. That Poor Dream is a very specific play. The investment by the company is strong and the clarity and vocabulary of the devised world will always be strongest to them. Sometimes in a devised piece specificity may not translate properly to the audience. One of the most specific moments in this play was the fourth wall breaking monologue section where the characters are no more and the actors address the thematic Dickens title. Up until this moment, the world of the play was character driven. With no warning or explanation, a series of presumably autobiographical thematic actor monologues halt the action. While individually they were quite beautiful and impactful, in the overall arc of the piece, especially knowing the characters will immediately resurface, its placement is bound to be a polarizing moment for the audience. Where it failed was its ability to allow the audience to understand exactly why the actors broke character. After T. Ray Campbell offers his stunning monologue, he rightly becomes emotional. But moments later he’s whisked back to portraying Miss Havisham, who’s not necessarily supposed to have those emotions. With the blurred worlds now coming to the forefront, the impact of the ending, something that had potential to be quite powerful, is lost. An argument can be made that the actor is playing both actor and character as one as a comment on the dream of being a working actor, but again, the clarity is lacking. Despite this singular moment, the overall devised piece is wildly innovative with a captivating use of past and present. The entire ensemble brought their heart to That Poor Dream. It was evident and clear through their performance. When creating this world, the characters may have a tinge of real hidden deep within, but those who were able to tap into the character world were by far the most interesting on stage. The most invigorating performance was Emily Perkins-Margolin as Jaggers. Perkins-Margolin’s characterization was brilliant, hilarious, and touching. The voice itself made the character fresh. 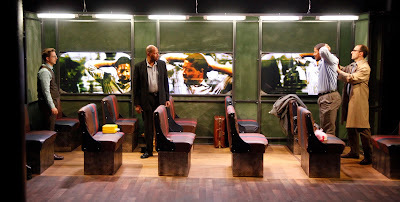 The chemistry between Edward Bauers’s Pip and Jocelyn Kuritsky’s Estella left something to be desired, it was the moments between Bauer and Terrell Wheeler’s Magwitchthat drove the show. Wheeler offered a heartbreaking performance as Pip’s benefactor. Director Jess Chayes had a mammoth task of guiding the That Poor Dream train, and fortunately her effort was sublime. Despite a gigantic gap between audience and actor due to the large downstage playing space, Chayes discovered a way to keep the piece intimate. Production and scenic designer Nick Benacerraf had an overall winning design on the stage of The New Ohio. Again, the gap between audience and actor was a bit of hindrance, he greatly made up for it with his brilliant creation of a train. 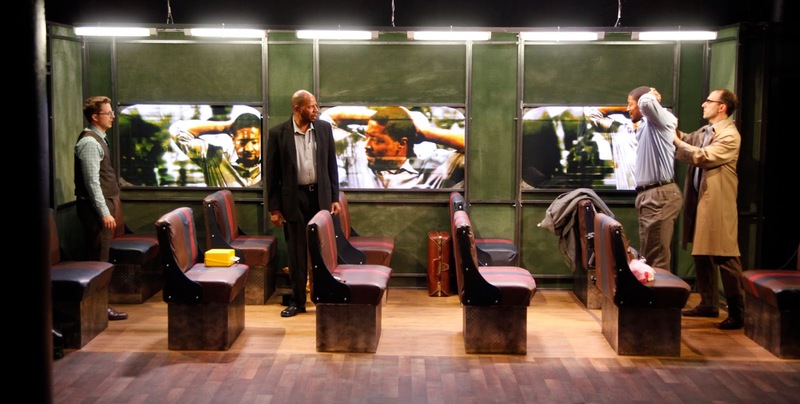 Benacerraf and lighting designer Derek Wright utilized the space wonderfully, especially through the exploration of the upstage world behind the train. Wright’s precise light shifts helped keep the action moving with his clean and distinct tones. On the innovation front, Ray Sun deserves much credit for the going above and beyond. However the overall video arc was inconsistent and muddied. Sure, the audience should always be able to allow their imagination to run free, but for those nitpicky few who know the realistic landscape could never be seen out the window of this specific train as the video was showing a trainless highway in New Jersey, it’s a bit jarring. Additionally in the specificity realm, the live feed delay used during the miss Haversham scenes was a bit confusing. Technological advances in theater should always be welcome as long as they’re being done properly. That Poor Dream is a captivating and daring journey of innovation. The heart of the project came to the forefront and shined. While there were many moments of clarity lacking, the expectations of something special were achieved.